This collection of thirty minigames is aiming to tempt gamers as a launch purchase as it utilises all of the Vita’s functions. Except the analogue sticks. And the face buttons. So yes! 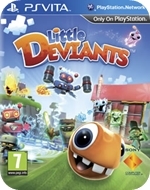 Smear, tickle, rub, wobble and even sing your way through the world of Little Deviants! The visual style is clearly aiming for a younger market, but nothing’s so garish as to make it unplayable for adults too. So you won’t feel like a berk playing it, unless people are watching you. You play as a race of aliens trying to rebuild their ship so they can return home. This will involve not attacking humans and defending their planet from zombies and robots. As you do. The games take advantage of the Vita’s unique functions for activities that you’ll be familiar with from other games -especially mobile games- or from real toys. Tilting the Vita itself is a simple one to grasp as you roll a balled-up Deviant around an obstacle course, collecting stars and time-extension clocks before reaching the exit. Or you may be rolling around a Pac-Man-style maze. These are simple games, but instantly playable, with fair room for improvement as you get used to the more subtle movements required to navigate trickier sections. Motion controls are also used for steering a ship through London while escaping a giant robot whale by zipping past buses and narrow archways. The best ones are 2D levels where you steer a UFO through caves to diffuse the bomb at the bottom. This one in particular handles very well and is a game you’ll want to retry. 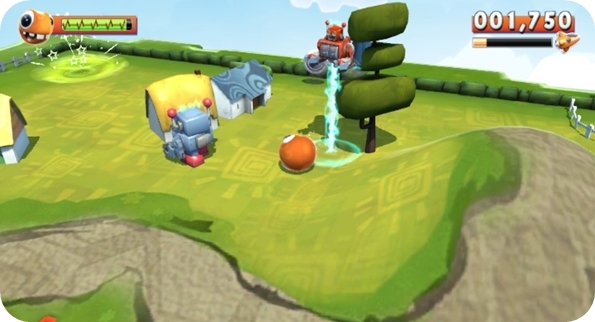 The rear touchpad is used for what was one of the most promising looking games, where you move your finger around under the ground in order to roll a ball around. It’s a lot harder than it looks in the demo videos as a deft touch is required. The game itself is another collect and escape type as you roll round a course. Initially a nightmare, but I found myself warming to it after a while as it’s an undeniably cool effect seeing the ground bulge at your touch. Whack-a-mole style games are a lot of fun as you use the front and rear touchscreens to knock enemies from windows, although reaching some of the middles ones on the rear pad can be a bit of a stretch for your fingers and brings to mind watching two tennis doubles players bickering about a middle shot that they both left. Pinching both screens for a game where you catapult a Deviant around a boxing ring to knock out zombies is another keeper, although the fella wielding a chainsaw did spoil things a little. One game that has you frantically tapping the screen to scare away birds does a fantastic job of showing off how the Vita can handle precise and fast inputs, something that I was worried about while navigating the terrible menus of ModNation Racers: Road Trip. The one microphone game is very hit and miss, with the idea being to sing, whistle or hum at a certain pitch to smash bottles coming along one of three lines. It’s just inconsistent enough to not really work, not to mention you have to get so close to the Vita, you’ll go cross-eyed if you try to look at the screen too. Not a bad idea though. There are some first-person AR (Augmented Reality) turret shooter games that use the rear camera to let you shoot flying robots around your room. Thankfully, you can use the shoulder buttons to fire. You’ll have to stand up or use a swivel chair though, as the crafty bots will fly rings around you. Using your room as a backdrop does feel pointless, but at least you’ll be able to see animated objects clearly. Some games have been very poorly thought out and barely work thanks to unclear controls. Most of them seem to be near the end of the game, which feels like a poor payoff for your time and effort. A ridiculous smelting game requiring front and rear touch to turn a wheel around while ‘tickling’ a fire was just the pits. Another game where you reflect a laser around a globe relied too much on the touchscreen, as it handles rotating the globe, dragging reflectors and bashing annoying robots. A nasty, disorientating mess. Each game has bronze, silver and gold awards for your score. Thankfully you only need a bronze to unlock the next game. Silver rewards unlock dull gallery items and gold is for the extra smug with too much time on their hands. For the most part, the higher rewards require too much effort and patience and take liberties with how long a minigame should go on for. I found myself often just going for bronze so I could play the next game, going as far as to purposely fail as soon as I had enough points to move on. The multiplayer options are very limited. There are no global leaderboards and no local options for turn-based play with individual versus score matches, which is a poor development choice. However, if any of your online friends own the game, you can attempt to beat any of their scores they have scored in their own time. Or you can challenge each other to beat scores on a specific game via a notification system. This could add some much needed incentive to keep playing the game if you’re a competitive type. If this minigames collection was controlled by standard analogue and face button controls, there wouldn’t be much of interest. But as a title to get you used to all the Vita’s functions it’s not a bad place to start. It’s knocking about for £18 already and will probably drop in price soon. It’s a good game for playing on your travels too as loading times are fair and the battery lasts considerably longer than playing something like Uncharted. You want HOW many points for Gold? The Short Version: As with most minigames collections, there are some duds, but with a little patience there are some fun ones to be found that embrace the Vita’s unique controls very well. As long as you can live with not getting gold for every event you might want to take a look at this if you see it at a good price.